Last spring, Torsten Hermann and Fraser Wilkinson set to work in creating a community garden in a weedy, garbage strewn lot in St. Henri. The lot had once been the site of two houses, which had burnt to the ground ten years ago. The two waded into waist-high grass to collect debris remaining from the houses, which included asphalt, concrete and broken glass--a half a ton of rubble in all. This undertaking lasted six weeks after they finished their day jobs. A working-class Montreal neighbourhood, St Henri was also the setting of Gabrielle Roy's famous novel The Tin Flute. Although the neighbourhood has changed somewhat over the years, it still lacks green spaces. Clearing the area was not the only work Hermann and Wilkinson had to do. In the beginning, some neighbours did not warm to their idea. "Some people told us that we were wasting our time, and the neighbour in front," Hermann said pointing to the house across the street, "didn't like it at all." One of the more difficult jobs involved clearing all the nettles and burdock from the area. Once the weeding was completed and the trees pruned, the pair put in a vegetable and spice garden, which they said was open to the public. When we visited the site, they had just put in a path with some broken patio stones donated by a neighbour and installed a makeshift fence.As their community garden started to take shape more neighbours started dropping off plants and dropping by to enjoy the greenery. Hermann showed me a line of flowers and shrubbery donated by neighbours who had received them in the borough flower give-away. Another neighbour had donated a large number of damaged flowers from the Atwater Market. Wilkinson planted this eye-catching patch of flowers at the front of the lot. Within a 10-week period, the lot had been transformed into a tranquil, green space in the middle of St. Henri. I spoke with neighbour Carlos Robinson-Alvarez, who told us about the positive impact Hermann and Wilkinson's project has had on the neighbourhood. "When I first moved here, there was a lot of vandalism and garbage lining the street. As you can see, that's no longer the case today. Now, we have people putting out flowers who have never gardened before," he said. He attributes his neighbours' new found enthusiasm for gardening a direct result of the street's guerrilla gardeners. The big surprise, however, came in October 2008, when Hermann and Wilkinson received an award in the Sud-Ouest En Fleurs gardening contest. "I was pleased with the prize because it lent some legitimacy to our project, but I am more pleased that the detractors on our street have become believers and enjoyed themselves this summer," said Hermann. 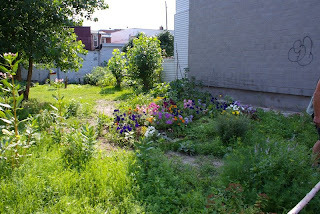 : Tresspassers in St. Henri Win City Gardening AwardTweet this!